The Eisenhower is a spacious two-story home that has a finished area of 2,044 square feet. It has 4 bedrooms, 2.5 bathrooms, a garage, and a cozy covered porch. 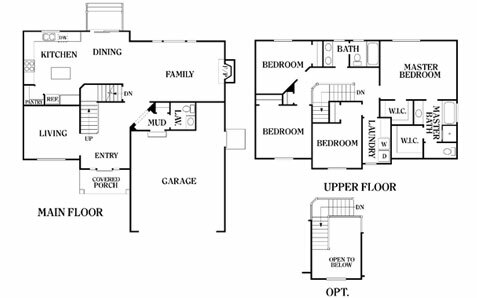 The first floor of the home has 2 main areas, a living room and a combined kitchen, dining, and family room. The bedrooms are all found on the second floor, including the master bedroom with its own full bath and walk-in closet. Alternatively, one of the bedrooms on the second floor can be converted into an open area. Perry Homes takes great pride in crafting incredible two-story and rambler homes at reasonable prices. Our company goes to great lengths to address the frustration of every potential home buyer by offering a wide range of customization and financing options. Our design personnel will walk you through every design option available for your house model so you can create something that is uniquely your own. To ensure a quick and hassle-free process, we’ll only start the construction after the details of the house plan have been finalized. Start planning for your future home today by getting in touch with Perry Homes Utah. Our company offers excellent customer service, and you can count on us to deal with post-construction concerns even after you’ve moved into your new home. Call us today at 801-264-8800 or leave a message on our Contact Us page.